I can’t remember if it was the late Col. David Hackworth or the late Col. Harry G. Summers Jr. (author of the influential retrospective on the Vietnam War, On Strategy) who made the telling point that any American general in World War II worth his stars would make it his business to know the names and backgrounds of all of the German generals opposing his forces, and that, by contrast, very few American generals in Vietnam knew even the names of the North Vietnamese Army generals opposing them, much less their backgrounds. So I agree wholeheartedly with Jeet’s contention that as a matter of military strategy, demonizing the enemy is dumb. In that regard, the Greek warrior ethic is indeed of significant utility, as was the chivalric code of medieval Europe which assumed that one’s opponents were fellow Christian combatants who should therefore be taken seriously on the field of battle (and of course whose personal identities and histories would be well known to both sides). 300: The Heroic West versus the Decadent East. 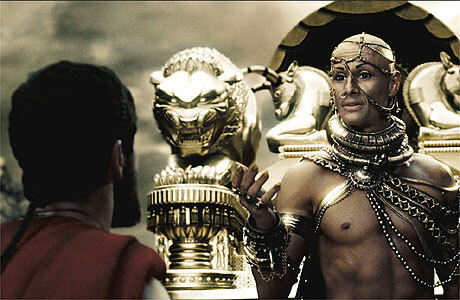 In the film 300, we see an absolute division between two contending armies. The Greeks (and especially the vanguard forces of the Spartans) embody everything good about humanity: they are handsome, cherish freedom, treat their women well, and have healthy loving heterosexual families (that last bit is especially risible for anyone who knows the actual history of Sparta and the surrounding Greek city-states). Opposed to the Greeks are the Persians, who are not just evil but also repositories of all sorts of unsavoury traits: many of them are deformed, all are lorded over by a tyrant, socially they are contemptuous of women and they indulge in all sorts of sexual perversions. 300, like its source material (Frank Miller’s comic book of the same name) is a work of popular entertainment and all too easy to take apart for its historical errors (University of Toronto classicist Ephraim Lytle did just that in a very funny article here). And only the ideologically blind (notably neo-con pseudo-scholar Victor Davis Hanson) have championed the comic and film as accurate guides to the past. Wertham: Progressive Scholar or Repressive Bluenose? Dr. Fredric Wertham: not too pleased to be reading a horror comic. Last week in the Globe and Mail, I wrote about David Hajdu’s entertaining new history of the post World War II anti-comics crusade, The Ten-Cent Plague, in which Dr. Fredric Wertham, an intellectual leader of the anti-comics crowd, is portrayed as a prissy, humourless scold. Bart Beaty, a leading comics scholar and also a very fine critic, is the author of an intelligent and sympathetic intellectual biography of Wertham. Not surprisingly, Beaty had problems with Hajdu’s book and my review. We thrash things out in today Globe and Mail, in a back-and-forth that can be found here. The situation in Tibet is disheartening but not without hope. Realistically, I think the best chance Tibet has is for the emergence of a Chinese Gorbachev or de Gaulle, a member of the ruling elite who recognizes the need for granting autonomy to colonized regions within the empire. What are the chances of that? Better than one might think. The Chinese political elite, while corrupt and authoritarian, is also very technocratic, and thus open to suasion. Although this fact doesn’t get reported much, China is alive with intellectual ferment. Particularly hopeful is the emergence in the last fews decades of a Chinese New Left (centered around the Journal Dushu), which is very critical of rising inequality. Dushu is arguably one of the most important magazines in the world, although for those of us who can’t read Chinese are only starting to get a glimmer of its impact. For more on the Chinese intellectual scene, see here and here. The New Left Review in particular has been doing a good job covering Chinese intellectuals (see here for a good history of Dushu). And for the issue of Tibet, it’s very much worth reading this article by Wang Lixiong, a Chinese writer who makes some concessions to Tibetian claims (albeit in the framework of a Chinese nationalism). Tsering Shakya, the leading Tibetian historian, responds to Wang Lixiong here. The entire exchange is worth reading to get a sense of the parameters of dissent in China, and how the Tibetian exile community might respond to overtures from Chinese reformers (should those reformers come to power). Ultimately, if there is going to be a just settlement of this issue, it will probably follow the lines rehearsed by Lixiong and Shakya. It should be added that whatever criticism one may have of Lixiong, he’s writing in China and has suffered much government persecution. His bravery, and the bravery of his wife, the poet Öser, is beyond praise. To say “Thank You” for your paid subscription to COMMENTARY, we will send you our full-color 39” x 26” World Terrorism wall map. Features include detailed inset maps highlighting countries battling narco-, Maoist, and Islamist terrorism, icons depicting aspects of world terrorism, political and topographical detail, definitions and facts, summaries of terrorist organizations, and sources and web sites recommended for further research. The World Terrorism wall map, an essential resource for anyone wishing to know more about the growing danger facing us, illustrates the global scope of the terrorist menace. Who is responsible for the housing bubble? In the National Post Terence Corcoran manfully tries to pin the blame on the Clinton adminstration. I’m not fan of Bill Clinton, but Corcoran could have noted that the Bush White House has followed in the same path (taking great pride in the rise of home ownership as a sign of a economic health, even though it was fueled by unsustainable lending). But really the key role in the whole fiasco was played by Alan Greenspan, that great hero of capitalism and Wall Street. Basically, U.S. policy makers like Greenspan have used cheap and easy-to-access credit as a substitute for social policy — the idea being that America’s stingy welfare state and low level of economic mobility can be justified by the fact that it’s easier for the working poor to buy houses, albeit on mortgages that they’ll never be able to pay off. That’s why the current crisis reflects very badly on capitalism and neo-liberalism. What united Clinton, Bush and Greenspan was a commitment to an economic order that said of the working poor, “let them eat credit cards and mortgages.” Now we see the consequences. It would have been much better to have had social democratic policies (especially in education and health care) that could have alleviated poverty rather than put the poor into a debt trap. Corcoran’s defence of capitalism today reminds me of my Marxists friends who said that communism hasn’t been discredited — that it was only badly implemented by Stalin. In fact, actually existing communism wasn’t very pretty, and neither is actually existing capitalism. The American Revolution: A Mistake? Jefferson: a loud yelper for liberty. Studying history always makes you a bit of a fatalist: coming to terms with the complexity of the past means realizing that large scale social changes are like tsunamis; they change the world and you have can react to them but you can’t stop them. You have to deal with the fait accompli and the facts on the ground, giving you a peculiar conservative respect even for large scale revolutionary change. I may not like what Robespierre or Mao stood for but there is no going back to the world before they existed. For that reason, counterfactual scenarios always seem flimsy and improbable: how can we measure out all the repercussions of history taking another path? Having said that, I was amused by Matthew Yglesias having second thoughts about the American Revolution. “Taking the long view, independence looks more like the somewhat tragic result of short-sighted thinking on both sides than like a heroic triumph for the forces of liberty,” Yglesias reflected. (Unlike most American foreign policy pundits, Yglesias doesn’t regard negotiations and compromise as inherently contemptible, hence he’s willing to entertain the thought that the American Revolution could have been avoided by adroit diplomacy).